CEOLIVE.TV produces professional media with CEO’s and executives from publicity traded companies and startups from the globe, where they share the insight of their companies' recent success and their businesses in the niche markets they occupy. Since 2008 the organization headquartered in Orlando, Florida has built the huge database of investors and partners worldwide due to the active media work such as interviews, chat videos and commentaries. CEOLIVE.TV also creates professional programs and videos for public companies and some private start-up companies as well. It has separate business media channel LIVETRADES.TV launched in 2017 which is dedicated to a community of professional traders and investors of all types to share their latest ideas and stock picks. SOC: Dear Mr. Elliott, thank you very much for dedicating your time to this interview, we would like to express respect from all the team and the Founder of SPINOFF.COM Ltd. We would like to start from the overview of your company. Could you please elaborate on the story of its creation, your professional background and the team? Mr. Elliott: I have been involved in US Capital Markets for over 20 years. First as a stockbroker, then financial advisor at UBS and Merrill Lynch. In 2005 I went to work for an Investor Relations Agency and we were trying to find dependable investor awareness services for some of the companies we worked with. During that search, we began developing our own platform involving the use of social media and marketing to generate targeted visibility for public companies. In 2006 that platform evolved into our two main divisions today Trilogy Media Partners, which produces professional media for public companies such as videos, articles, websites, etc. and Capital Markets Connect which is a consulting firm helping companies create strategies to get their story in front of investors. SOC: We know that your company produces professional media with CEO and Founders mostly American, as well as European spinoffs and startups. Could you please describe in more details what does your company specializes at? Mr. Elliott: Capital Markets Connect is a cutting-edge financial media consulting agency that brings together great companies and real investors in both U.S. and international markets. We provide companies with the tools and expertise to develop multi-platform initiatives and premium digital content to reach investors. Our expert team of advisors develop strategies to help companies maximize their value and potential reach to a wide variety of players in today's fast-moving capital markets, including investors, portfolio managers, hedge fund managers, day traders, family offices and more. Our multi-platform media strategies help our clients leverage the most powerful communication channels available today to maximize investor reach and shareholder retention. Our solutions are delivered through a dynamic integration of websites, social media, video and email. Our mission is to save busy executives time by allowing them to concentrate on building a business and brand, while we educate and attract shareholders. Our Communications team creates strong relationships by direct one on one communication between potential and current investors. SOC: Mr. Elliott we've heard about your professional media work such as program and brand video creation for public companies as well as for private start-up companies. Could you please provide some examples of the recent projects or interviews? Mr. Elliott: Sure. 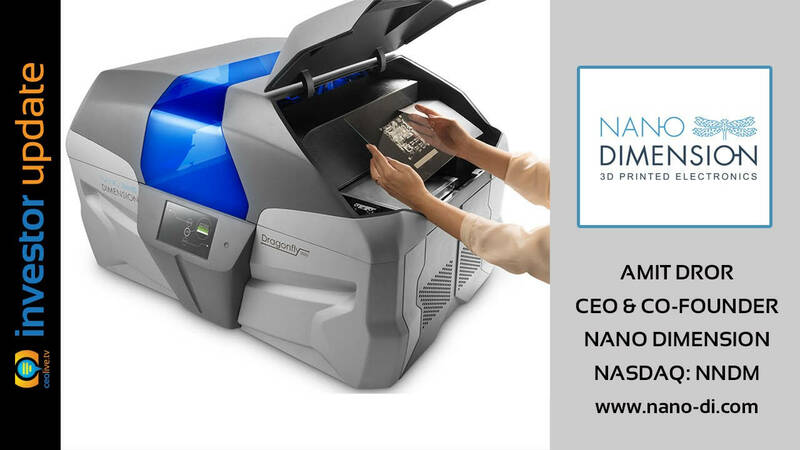 Recently we have, as a matter of fact, interviews with several companies from Israel including Foresight Auto which trades at Tel-Aviv Stock Exchange and under FRSX on NASDAQ in the US, as well as 3D printing company Nano Dimension which trades also in Tel Aviv, but here in the US as well on NASDAQ under ticker NNDM. For more information, you can visit our websites ceolive.tv and livetrade.tv and see some of our latest CEO interviews and investor profile videos. We also interview investors and traders that talk about what the markets are doing and provide commentary on companies that they're currently investing in and trading. So while LIVETRADES .TV provides that information, CEOLIVE.TV is focused on the CEO interviews. SOC: As we understood you have separate channel LIVETRADES.TV. How did you come up with the idea of its creation? What is it about? Mr. Elliott: LIVETRADES.TV targets traders and investors. It features high profile professional traders talking about the market and their favourite stocks through interviews, chart, videos and commentary every day. This group of traders all have a large network of active investors that follow them daily for ideas and recommendations. In addition to content and the distribution through that network, we have a working group of traders behind the scenes, some with paid subscribes that are putting out words on our clients throughout the week and in some cases writing reports. This group is growing every day and they deserve each other network of loyal followers and subscribers which helps us create a level of trust with retail investors that we never had before. We can get exposure to a wider variety of investors every day at the grassroots level. It gives us direct access to earned media results without advertising. A lot of people start to realize that there are thousands of traders online every day talking about stocks and companies and come into a very reputable group. It's really what all major advertisers are doing. This is how we came up with the idea. We saw these brands recruiting high profile social media personalities and bloggers to talk about their brand with LIVETRADES.TV. We're doing the same thing but with stock traders and bloggers. SOC: Could you please tell us which problem you might solve for the spinoff founders from the globe and how does your CEOLIVE.TV can be helpful for them? Mr. Elliott: Reaching the right investors and engaging their interest is an ongoing challenge for all companies both public and private. The need to raise capital is ever present in order to grow operations. So our target at financial media sites like CEOLIVE.TV and LIVETRADES.TV to offer our clients a platform to reach an active investors' audience in a cost-effective manner and to keep them engaged. SOC: Dear Mr. Elliott, from your vast experience after the huge amount of the interviews with spinoff and startup founders and CEO's which bits of advice and warnings you might give spinoff founders in the sphere of your activity? What mistakes, in some cases even fatal, should they avoid? Maybe your LIVETRADES.TV can give them some tips? Mr. Elliott: First of all, keep your investor audience informed and be transparent. Whether private or public, if you're raising money you have investors that you have to answer to. Regular dialogue and communication with your investors is key to maintaining their trust and building a brand they believe in. Whether you use your own in-house investor relations team or outsource it, just make sure you have a plan in place and you're consistent in its execution. SOC: Money is a critical issue for the rising companies. Spinoff founders take into consideration all the expenses. One of the expected questions from them is whether they might receive a discount or some support from your company and under which terms? Mr. Elliott: We absolutely support spinoff companies as well as other startups and early stage growth companies. We provide some of the best rates in the industry to help them create professional media to reach their investor audience. We have a wide variety of media and public relations packages that we can tailor to the needs and budget of any company. In addition to videos company profiles and Buster ads PR and marketing campaigns, we also consult with these companies to develop an ongoing strategy to successfully execute an effective investor outreach program. We would be interested in doing an initial interview with such rising spinoffs at CEOLIVE.TV and LIVETRADES.TV to get them exposure to our investor audience here in the US. SPINOFF.COM team would like to express gratitude for the time you have dedicated to this interview. We wish only the best for your CEOLIVE.TV and LIVETRADES.TV channels and we hope that we will fruitfully collaborate in our rather common activity supporting spinoffs' and startups' globally.